The Big Fish Small Pond Effect – Sinking It In! As a continuation to our previous discussion on “elite” primary schools, we examine briefly the “Big Fish Small Pond” effect which may impact how a child performs in an elite primary school. In a nutshell, this theory looks at how the people around us affect the ways in which we capitalise on our potential. Research has shown that people tend to perform better when they perceive their abilities to be superior to their peers, i.e when they are big fishes in a small pond. The “Big Fish Small Pond” effect was initially conceived from observations of selective schooling, in which children are often streamed according to their abilities. In the UK, for instance, many children still take the 11-plus exam, a test that determines whether a child gets in to a more prestigious school based on their academic ability. You would think that this success would inspire the brighter children to work even harder at their studies. Unfortunately, humans are naturally competitive and tend to compare their abilities with the people right next to them. 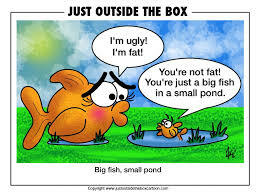 This means that a child in the “high-ability classes” (the little fish in the big ponds) will often feel less confident about their academic potential, compared to someone of equal ability who was not surrounded by high-achievers (the big fish in the little ponds). Instead of being an ego boost, attending a prestigious school can in fact make a child feel inferior, dousing their motivation and reducing their chances of success. If this is true, then a child in a mediocre school may enjoy more later success than a child (with similar abilities) in an elite school. This is because being among peers who are not high-achievers boosted his confidence which in turn spurred him to perform better in his own studies. Taking the above into consideration, is it then better to enter a prestigious school where most of the pupils are over-achievers? Or should a child settle for a humbler school where he may find that he is top of the class? Parents might want to ponder over this “Big Fish Small Pond” effect before they decide whether to put their child in an “elite” school. “Elite” Primary School = Later Success In Life?